UFC betting and sports betting as a whole has gained popularity over the past few years. 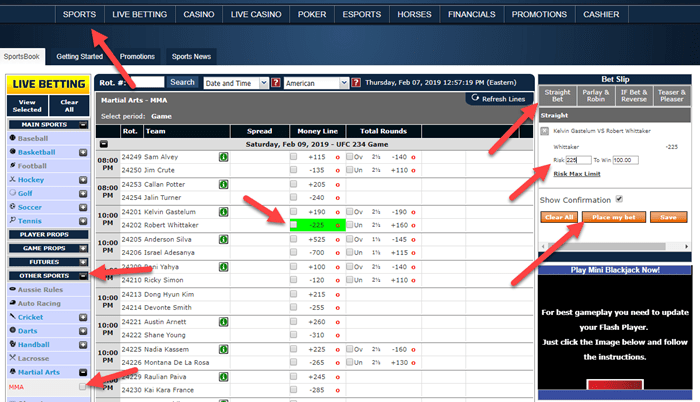 I added this page to help Ohio, Michigan and Indiana residents understand how to bet on UFC fights online. Our top rated betting site for Americans. Brief summary of sports betting legal climate in Ohio, Michigan and Indiana. UFC betting example and brief summary of other UFC bets you can make. 3 step guide you can follow to bet on the UFC online. SportsBetting.ag is our #1 rated betting site for Americans, including residents of Ohio, Michigan and Indiana. SportsBetting has served the United States betting market (with no state restrictions) for over 15 years and over that time has become one of the most popular and trusted sportsbooks for American bettors. You can see the commitment to American players shine through in the bet offerings, deposit/withdrawal options and customer service provided at SportsBetting.ag. At the current time it’s not legal to operate a sportsbook in Ohio, Michigan or Indiana. Ohio started the process towards legalizing sports wagering with a placeholder bill expressing intent, but nothing has come of it. Michigan gained some traction towards legal sports betting with a law approved in 2017 that allowed any casino license holder in the state to accept sports bets. However, the state’s governor vetoed the law and no further progress has been made. In Indiana a new bill related to sports betting was introduced in January 2019, after a 2018 bill that was drafted with help from the NBA and MLB failed to gain traction. We will have to wait and see if any progress is made this year. All of that said, if you live in Ohio, Michigan or Indiana you can still be on sports online. You just have to place your bets with offshore betting sites that are licensed and regulated outside of the USA. SportsBetting is licensed and regulated in Panama, so it falls into this category. There are a few different bets you can make on a UFC fight, but the bet that gets the vast majority of action is simply wagering on which fighter will win. In the above example, Robert Whittaker is a -225 favorite to win the fight. This means you would have to risk $225 to win $100 betting on Whittaker. Gastelum is a +190 favorite, so a $100 bet on Gastelum would win $190 (pay $290). Total Rounds – Over/under bet on length of the fight. Round Betting – Pick the fighter and the finishing round. Method Of Victory – Pick the fighter and how the fight ends (submission, knockout, decision, etc). Check out our UFC betting page for a further breakdown of these bets. Complete these three steps to get your UFC bets placed online. SportsBetting is our #1 rated betting site for American players. Log into your account and click on ‘Cashier’. Select one of the deposit methods (Visa, MasterCard, Skrill, Neteller, bitcoin, etc) and complete the instructions to fund your account. You can use promo code SB1000 when making your first deposit to opt-in to the 50% matching bonus up to $1000 offered by SportsBetting. Click on ‘Sports’ from the top menu bar, open the ‘Other Sports’ drop down menu and select ‘MMA’. Select the bet you want to make and click ‘Straight Bet’ on the Bet Slip. Enter your wager amount and click ‘Place my bet’ to lock it in.